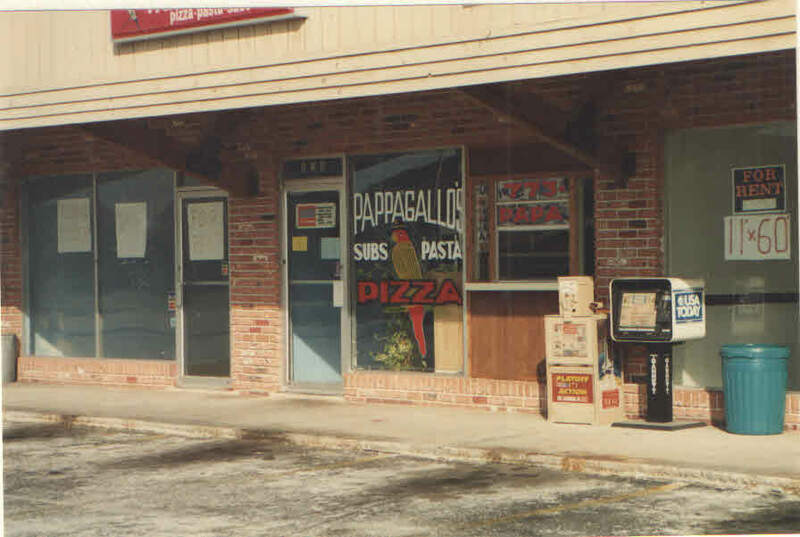 So here’s how Pappagallo’s pizza in Satellite Beach 3217737272 went from an idea I had to a business that has supported my family since 1990.
our own to deal with. I think it just became too many people swimming in the same pool. myself looking at the classified ads (there were no online sites back then) I went through the ads from column to column looking for the job that required no college degree, not a lot of experience at any usable trade, and that paid a huge amount of money. If I had found that job I was still unsure what I would do with my other 2 wishes. wanted.” I had nothing to lose and nowhere to be so I pulled in the small strip center and went inside. The place had been a popular hot dog place that moved to another location and was followed by some questionable restaurateurs who had put a pizza place there but had basically abandoned it when their dreams of fame and fortune didn’t come to fruition in a couple months. the man who wrote the sign what he was looking for in a partner? It was almost 30 years ago so I can’t quote what he said but the idea was he currently was only open from 11-2 then left to pick up his daughter then he returned from 4-6 and closed at 6:30. He was sitting at a booth reading a newspaper (remember I said people still did that in 1990) and didn’t seem to be very concerned about that fact that I was there an hour and the phone didn’t ring and no one came through the door. He explained how much the rent and utilities were per month and how much business he was doing a day, pretty sure that was an exaggeration but I took his word for it. He told me he needed someone to buy in for $5000 and they would be a 49% owner, I guess he wanted to have controlling interest so he wouldn’t lose his newspaper reading rights. I called my uncle John and asked for his opinion on this incredible deal I had found. I was young and naïve (the word that is polite for dumb), I really thought this could be a great idea for me and although I was sure it would work, I was positive I needed Johns input. John asked me,”what are you buying?” “How much business is he doing right now?” And “how was this partnership really going to work?” To John it just seemed like I was buying the honor of working for free while he did his errands and read the paper. Honestly I was disappointed, but I trusted Johns opinion and I really had no opposing argument to what he had said. I stopped by the next day and told the owner of the sandwich shop that I appreciated his time but the deal wasn’t for me. I look back and I really think that just by showing him some respect and not be confrontational about what I was buying and what I would get was really the best way to walk away. I could tell he was down on his luck and didn’t see the advantage of telling him he had nothing to actually sell and walk out like a jerk. So my dream of owning my own place looked a little foggy at best. A few days went by and I considered going back to construction, my heart wasn’t in it but I had bills to pay and I wasn’t really good at being unemployed. I think it was 2 days later and my phone rang (not my cell phone those didn’t exist yet.) It was the sandwich place owner, he told me he was done and was basically abandoning the store. He gave me the landlords name and phone number and said that she owned everything in the place to cover unpaid rent. He wished me luck and said that I seemed like a decent kid and he hoped it worked out for me. previous owner said she wasn’t fond of restaurant people because the last few tenants she had in that spot had left her slightly bitter. The next morning I put on my big boy voice and called this lady who didn’t know me and already didn’t like me because I was one of those “restaurant people.” I called her told her that I was interested in the small restaurant space in her plaza, she immediately said no. It took some talking but I got her to meet with me to at least hear what I had to say. Somehow she agreed so we set a time to meet at another place up the street so she could tell me no in person. I set out to meet her and her son (he managed the property for her) to say I was nervous is a huge understatement. I rehearsed what I would say maybe 1,000 times in a few hours. Over the years I’ve told this story many times, as I got older I began to realize how silly I must have looked at 23 meeting this lady and her 50 year old with her and me holding with my K-Mart binder full of menu notes and ideas I had for a space she had already decided to empty and turn into another form of retail shop. Since she owned the equipment I asked her to lease me the space and add an additional charge for the equipment, give my 6 months and if I’m even one day late with any bill I would vacate immediately and she was obviously free to do whatever she felt was the right for the space. I was willing to sign any legally binding document that spelled those terms out. To this day I don’t know why but she agreed, but she said yes and didn’t make me sign anything to tie me to leaving if I couldn’t make it work, she said I’m going to trust you, please don’t make me regret it. A lot happened between that day and opening but we got opened and struggled a lot but every day was fun and every day I went home exhausted but happy that my little shop was growing. I never thought about it not working, I had to support myself, pay my bills on time and I had promised that lady that I wouldn’t make her regret trusting me. Pappagallo’s Indian Harbour Beach 3217737272 had its up and downs those first few years and I spent a lot of nights almost working around the clock to keep it going, it was a labor of love and responsibility and I had to prove to myself that I could make this thing work. It was almost 4 years later, right around Christmas time, I had dropped my son off at karate class and was delivering a catering to a regular customers Christmas party (for the record I still see this guy several times a week.) I was coming back over the causeway, the sun was setting and I was reflecting with pride on how far we had come in 4 years. Our bills were paid we had purchased our equipment from the landlord and things were on the upswing, yeah I was feeling pretty proud.